In this era of polarized politics, a new polarizing subject seems to have arisen — the analysis (or lack thereof) of the votes cast before Election Day. And the stakes are only getting higher: in 1996 only 11% of votes were cast early. Twenty years later, the 2016 election saw 41% of voters exercise their franchise before the November 8th election. It’s conceivable that the crucial 2018 midterm elections will see an even larger share of voters cast their vote early. Anecdotally, this cycle we’ve seen diminishing coverage and analysis of these early votes. This is an overcorrection from the 2016 election, where the media dedicated significant bandwidth to parsing the early vote, and in most cases framing it as a sign of Hillary Clinton’s likely victory. If you saw me on your TV around this time in 2016, odds are I was feeding that narrative. We made lots of mistakes in how we framed the early votes in 2016. I’d argue that the two biggest errors were the lack of historical context applied to the analysis (i.e., how did the vote compare to prior elections) and not enough thought given to if the surge in Dem early vote simply represented a cannibalization of Election Day votes, rather than a true surge in Democratic intensity. With all of that said, ignoring the early vote this year would be a mistake. There’s lots to be learned from analyzing the early vote. But there are also pitfalls. Today I’ll be focusing on what we can and can’t learn from the early vote. I’ll be following up with actual findings in the coming days. As of this moment, close to 6 million Americans have already voted. Thanks to the depth of data TargetSmart has on our voter files about each individual voter, we have the ability to perform very rich analyses of the voting electorate in real time. To ignore granular data on millions of voters would simply be foolish, especially when you consider the attention we pay to polls that represent conversations with just a few hundred voters. It was in this spirit that our team developed TargetEarly — the first of its kind, unprecedented depth of data regarding the early vote made available to the public. But as the saying goes, “with great power comes great responsibility,” so let’s talk about what we can learn from this information, and what we cannot infer. Let’s start with the obvious. The early vote data tells us who has voted (as an important, but often overlooked side note — we only know IF someone voted, we don’t know for whom they voted). Connecting this information to our voter file that contains a wealth of demographic and historic political data, we can begin to infer some important points. Okay, so we know who voted. Now what? The first thing I’m looking at is how the early vote compares to prior elections, in this case 2014 and 2016. Are any particular groups surging relative to prior years? Looking at party registration (or modeled partisanship in states that don’t allow partisan registration), age, race/ethnicity, and gender can tell us a lot. 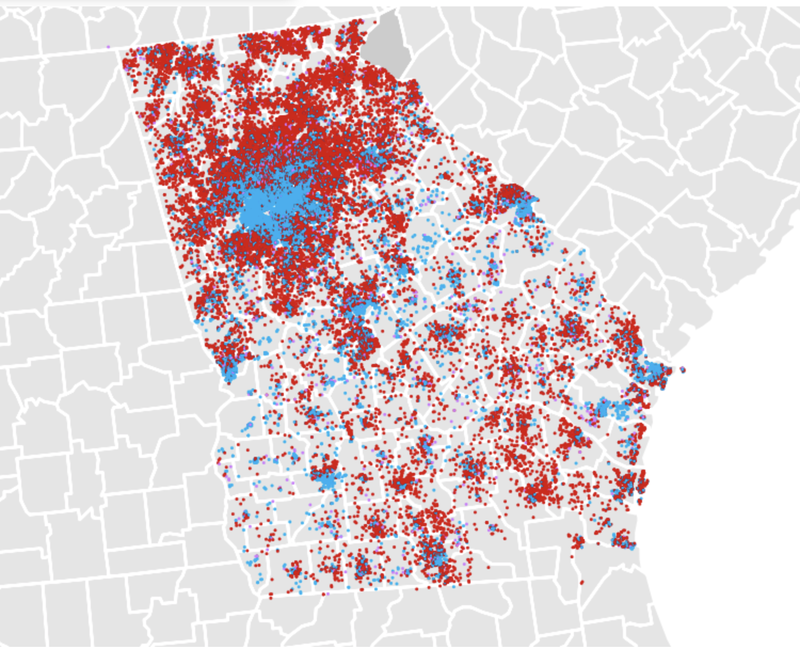 A surge in African American voters, as we’re seeing in Georgia, would suggest that Democratic intensity is high. Conversely if we were to see a surge in white men voting early, it would tend to bode well for Republicans. The second piece of context I’m looking for is prior behavior of the individuals who have voted early. Sometimes higher intensity may just mean voters who would have voted anyway but simply chose to cast their ballot early instead of on Election Day. That’s less meaningful in the grand scheme of things. If we are seeing a surge of first-time voters, or otherwise “low propensity” (lower probability of voting) voters who tend to skew heavily towards one party or another, this is indicative of a meaningful intensity advantage. 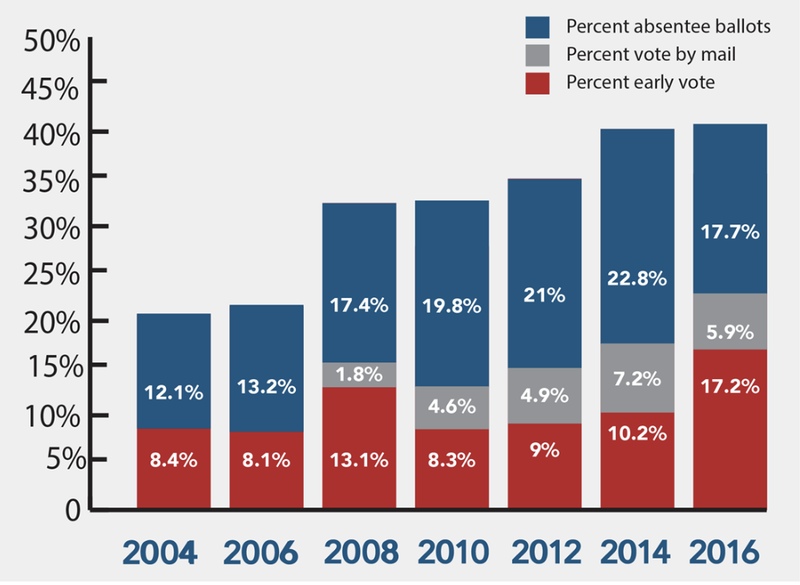 For that reason, TargetEarly breaks down the early vote by various categories of past vote history, from the “Super Voters” on the top end of the scale, to people who have never voted before at the other end. Look at the vote share for each of these groups and the generic partisanship. A larger share and/or a larger advantage for either party among the lower propensity voters is a good sign for that party heading into Election Day. Most simply, the early vote data can’t tell us how these people have voted. We don’t know if they supported the Democrat, the Republican, or some other candidate. What we can do is infer a fair amount from party registration and modeled partisanship, but those are imperfect tools. For example, polls suggest that Democrats will over perform their recent support levels with better educated suburban voters, especially women, which will put a dent in GOP numbers. Yet at the same time Republicans have made clear inroads with less educated white rural voters. These crossover voters will confound any attempt to accurately predict exactly how the early vote is performing. The early vote data, as noted above, can be very misleading when presented without needed context. For example, recent reports on the early vote suggested that GOP advantages in early vote turnout over the first week were indicative of perhaps a smaller “Blue Wave” than most polls and most analysts had predicted. What was missing here was the historic context — the first week of voting is comprised mostly of restrictive vote methods like absentee vote by mail. Often times voters need a reason, such as an inability to vote in-person on Election Day, which skews older and more conservative. And if you compared the turnout to historic benchmarks, you would find that the GOP advantage in most states was actually much narrower than in the ’14 or even ’16 elections. Covering the early vote isn’t easy. To make sense of it you need to have access to reams of data and the ability to compare that data to previous cycles. Too few news outlets, pundits and academics have easy access to the type of data needed to do a thoughtful analysis — let alone the bandwidth to do such reviews. When we launched TargetEarly this week, one of our goals was to tear down that wall and make this high-level data more accessible and transparent to more people than ever before. While the site is updated with fresh data as often as twice a day, we’ll share analysis, best practices and tips in this space to help demystify this vital early vote data.